There are two kinds of promises we make: those we offer to others, and those we make to ourselves. The benefit of promises made to other people is that someone else will hold us accountable for what we just vowed to do on their behalf. They need or want something and we have an ability to contribute at some level. As long as we don’t forget, there will be no-harm, no-foul. But somehow the promisee always remembers longer than the promisor. What sorts of things have you promised other people? Button eventually fell off the shirt and was permanently lost. Next week, you’re just as broke as this week. The burned out light bulb didn’t bother you as much as you thought it would. The neighbor’s tile saw is still sitting in the basement, 5 years later. Sometimes the reason we forget to do the things we promised is that the “need” isn’t staring us in the face anymore. It’s been decades since I saw the sheet music I lent to a student back in 1990. No doubt it’s buried in a deep drawer somewhere in another state by now. My husband’s pants with the ripped pocket sat on HIS dresser for nine months, rather than mine. While I imagine they bugged him daily, I forgot about the promise almost as soon as it was made. What sorts of things have you promised yourself? I’m going to back up my laptop every month. I’m going to exercise 3-5 times a week. I’m going to finish writing my book. I’m going to put money into a retirement account. I’m going to lose 10 pounds this year. Computer virus fried all yourwork. The treadmill is covered in dust. Rewrote Chapter 1 six times. Could barely pay your taxes, let alone invest. Only 15 pounds to go! 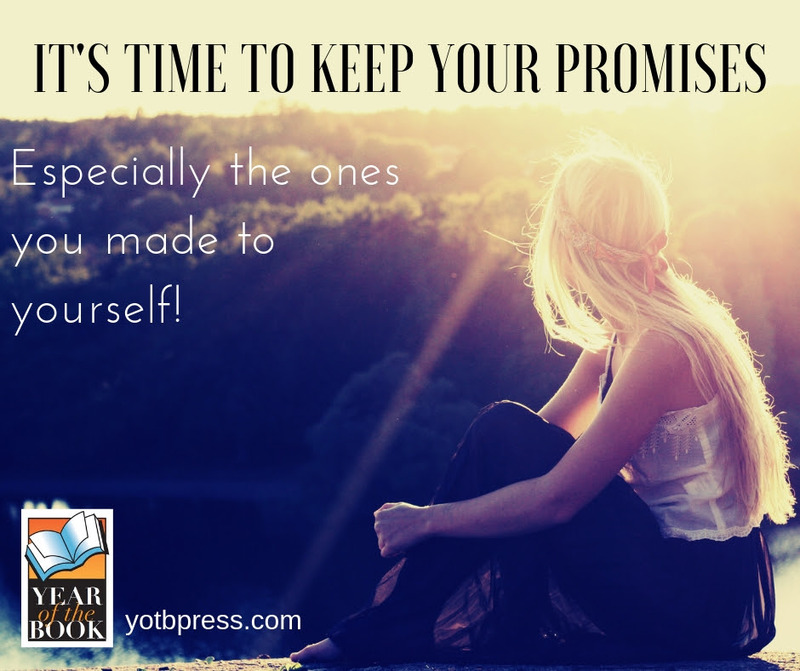 Are you guilty of neglecting the promises made to yourself? Maybe those goals aren’t staring you right in the face enough. Rock guitarist Steve Mastroianni teaches his students – the ones who come to lessons claiming they “didn’t have time to practice this week” – the following life hack. As soon as they get out of bed in the morning, they must place the guitar on the bed, in the exact spot where they sleep. That way, in order to get to bed that night, they’ll have to physically pick up the guitar to move it. Hey, and while the guitar is already in your hands… why not practice that one new chord and strumming pattern? But others require more discipline, like “attend a flute workshop in The Netherlands.” Thanks to gaining 15 pounds, I’ve been able to address the goal of “lose 5 pounds” several times this year, ha, with no discernable benefit. What promises can you fulfill this week? Either ones you’ve made to other people… or ones you’ve made to yourself?? I’d love to hear from you. Just click REPLY!